In the Attendee Group Overview you are able to edit the group via „Pencil“-Button 1 or deleting the group with the „Bucket“-Button 2. After clicking the “Pencil”-Button it is possible to change all the settings and meta data which were set in the beginning while adding a new attendee group. At first you can change the key (short name) of the group, the name or security level 1. Also weekday, time and location etc. 2 can also be changed. Furthermore there is an overview of the Meeting Minutes Agenda for the Attendee Group which can also be edited. 3. 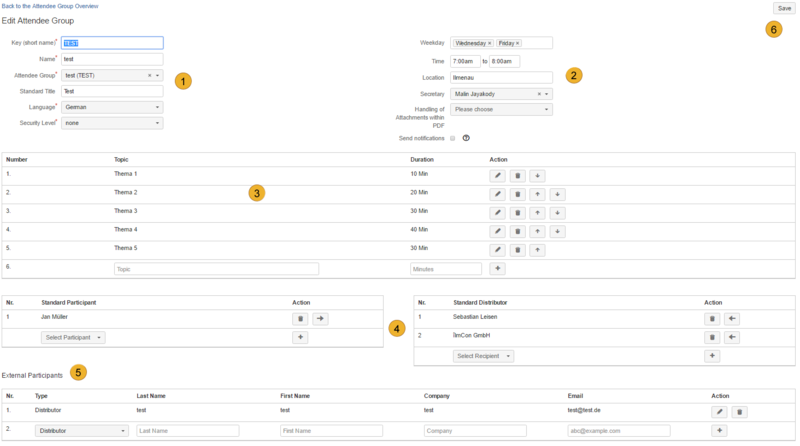 At the next section you can make modifications on standard participant/distributor 4 and finally it is possible to add, edit or delete external participants/distributors 5. After finishing your modifications, press the “Save”-Button6. 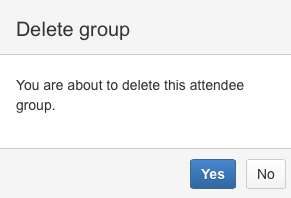 Option 1 – Delete empty Attendee Groups. If you want to delete an Attendee Group that contains no meeting minutes you have to confirm the following dialogue with “Yes”. The Attendee Group is now deleted and will not be shown any longer. If you want to delete an Attendee Group that contains one or more Meeting Minutes you have to confirm the following dialogue with “Yes”. You also get the possibility to move the Meeting Minutes to another Attendee Group. Choose the Attendee Group you want and click “Save changes”. The Meeting Minutes being transferred to the chosen Attendee Group. By deleting an Attendee Group every Meeting Minute you created will also be deleted, whether it is processed or not. Tasks you created in a Meeting Minute won’t be discharged when deleting the Attendee Group, they are still available in JIRA. Deleting of attendee groups is only allowed to JIRA System Administrators.